For the simultaneous famine across the USSR, or the Kazakh SSR, see Soviet famine of 1932–33 and Kazakh famine of 1932–1933. Foreign relief rejected by the State. Respectively 176,200 and 325,000 tons of grains provided by the State as food and seed aids between February and July 1933. The Holodomor (Ukrainian: Голодомо́р;[a] derived from морити голодом, "to kill by starvation") was a man-made famine in Soviet Ukraine in 1932 and 1933 that killed millions of Ukrainians. It is also known as the Terror-Famine and Famine-Genocide in Ukraine, and sometimes referred to as the Great Famine or The Ukrainian Genocide of 1932–33. It was part of the wider Soviet famine of 1932–33, which affected the major grain-producing areas of the country. During the Holodomor, millions of inhabitants of Ukraine, the majority of whom were ethnic Ukrainians, died of starvation in a peacetime catastrophe unprecedented in the history of Ukraine. Since 2006, the Holodomor has been recognized by Ukraine and 15 other countries as a genocide of the Ukrainian people carried out by the Soviet government. Early estimates of the death toll by scholars and government officials varied greatly. 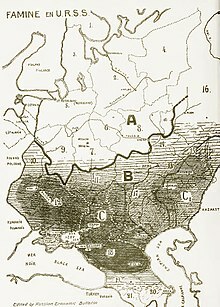 According to higher estimates, up to 12 million ethnic Ukrainians were said to have perished as a result of the famine. A U.N. joint statement signed by 25 countries in 2003 declared that 7–10 million perished. Research has since narrowed the estimates to between 3.3 and 7.5 million. According to the findings of the Court of Appeal of Kiev in 2010, the demographic losses due to the famine amounted to 10 million, with 3.9 million direct famine deaths, and a further 6.1 million birth deficits. Some scholars believe that the famine was planned by Joseph Stalin to eliminate a Ukrainian independence movement. 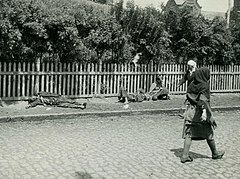 Using Holodomor in reference to the famine emphasises its man-made aspects, arguing that actions such as rejection of outside aid, confiscation of all household foodstuffs, and restriction of population movement confer intent, defining the famine as genocide; the loss of life has been compared to that of the Holocaust. The causes are still a subject of academic debate, and some historians dispute its characterization as a genocide. The word Holodomor literally translated from Ukrainian means "death by hunger", or "killing by hunger, killing by starvation". Sometimes the expression is translated into English as "murder by hunger or starvation". Holodomor is a compound of the Ukrainian words holod meaning "hunger" and mor meaning "plague". The expression moryty holodom means "to inflict death by hunger". The Ukrainian verb moryty (морити) means "to poison somebody, drive to exhaustion or to torment somebody". The perfective form of the verb moryty is zamoryty – "kill or drive to death by hunger, exhausting work". The word was used in print in the 1930s in Ukrainian diaspora publications in Czechoslovakia (as Haladamor), and by 1978 by Ukrainian immigrant organisations in the United States and Canada. However, in the Soviet Union – of which Ukraine was a constituent republic – references to the famine were controlled, even after de-Stalinization in 1956. Historians could speak only of 'food difficulties', and the use of the very word golod/holod (hunger, famine) was forbidden. Discussion of the Holodomor became more open as part of Glasnost in the late 1980s. In Ukraine, the first official use of the word was a December 1987 speech by Volodymyr Shcherbytskyi, First Secretary of the Central Committee of the Communist Party of Ukraine, on the occasion of the republic's seventieth anniversary. An early public usage in the Soviet Union was in February 1988, in a speech by Oleksiy Musiyenko, Deputy Secretary for ideological matters of the party organisation of the Kiev branch of the Union of Soviet Writers in Ukraine. The term may have first appeared in print in the Soviet Union on 18 July 1988, in his article on the topic. "Holodomor" is now an entry in the modern, two-volume dictionary of the Ukrainian language, published in 2004. The term is described as "artificial hunger, organised on a vast scale by a criminal regime against a country's population." The famine affected the Ukrainian SSR as well as the Moldavian Autonomous Soviet Socialist Republic (a part of the Ukrainian SSR at the time) in the spring of 1932 and from February to July 1933, with the greatest number of victims recorded in the spring of 1933. Between 1926 and 1939, the Ukrainian population increased by 6.6%, whereas Russia and Belarus grew by 16.9% and 11.7%, respectively. From the 1932 harvest, Soviet authorities were able to procure only 4.3 million tons as compared with 7.2 million tons obtained from the 1931 harvest. Rations in town were drastically cut back, and in the winter of 1932–33 and spring of 1933 people in many urban areas were starved. The urban workers were supplied by a rationing system (and therefore could occasionally assist their starving relatives of the countryside), but rations were gradually cut; and by the spring of 1933, the urban residents also faced starvation. At the same time, workers were shown agitprop movies, where all peasants were portrayed as counterrevolutionaries hiding grain and potatoes at a time when workers, who were constructing the "bright future" of socialism, were starving. The first reports of mass malnutrition and deaths from starvation emerged from two urban areas of the city of Uman, reported in January 1933 by Vinnytsia and Kiev oblasts. By mid-January 1933, there were reports about mass "difficulties" with food in urban areas, which had been undersupplied through the rationing system, and deaths from starvation among people who were withdrawn from the rationing supply. The withdrawal was to comply with the Central Committee of the Communist Party of Ukraine Decree of December 1932. By the beginning of February 1933, according to reports from local authorities and Ukrainian GPU, the most affected area was Dnipropetrovsk Oblast, which also suffered from epidemics of typhus and malaria. Odessa and Kiev oblasts were second and third, respectively. By mid-March, most of the reports of starvation originated from Kiev Oblast. By mid-April 1933, Kharkiv Oblast reached the top of the most affected list, while Kiev, Dnipropetrovsk, Odessa, Vinnytsia, and Donetsk oblasts, and Moldavian SSR were next on the list. Reports about mass deaths from starvation, dated mid-May through the beginning of June 1933, originated from raions in Kiev and Kharkiv oblasts. The "less affected" list noted Chernihiv Oblast and northern parts of Kiev and Vinnytsia oblasts. The Central Committee of the CP(b) of Ukraine Decree of 8 February 1933 said no hunger cases should have remained untreated. Local authorities had to submit reports about the numbers suffering from hunger, the reasons for hunger, number of deaths from hunger, food aid provided from local sources, and centrally provided food aid required. The GPU managed parallel reporting and food assistance in the Ukrainian SSR. (Many regional reports and most of the central summary reports are available from present-day central and regional Ukrainian archives.) The Ukrainian Weekly, which was tracking the situation in 1933, reported the difficulties in communications and the appalling situation in Ukraine. Evidence of widespread cannibalism was documented during the Holodomor. Survival was a moral as well as a physical struggle. A woman doctor wrote to a friend in June 1933 that she had not yet become a cannibal, but was "not sure that I shall not be one by the time my letter reaches you." The good people died first. Those who refused to steal or to prostitute themselves died. Those who gave food to others died. Those who refused to eat corpses died. Those who refused to kill their fellow man died. Parents who resisted cannibalism died before their children did. The Soviet regime printed posters declaring: "To eat your own children is a barbarian act. ":225 More than 2,500 people were convicted of cannibalism during the Holodomor. The reasons for the famine are a subject of scholarly and political debate. Some scholars suggest that the man-made famine was a consequence of the economic problems associated with changes implemented during the period of Soviet industrialisation. There are also those[who?] who blame a systematic set of policies perpetrated by the Soviet government under Stalin designed to exterminate the Ukrainians. The collectivisation policy was enforced, entailing extreme crisis and contributing to the famine. 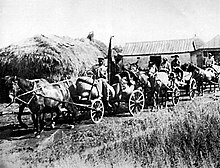 In 1929–30, peasants were induced to transfer land and livestock to state-owned farms, on which they would work as day-labourers for payment in kind. Collectivization in the Soviet Union, including the Ukrainian SSR, was not popular among the peasantry and forced collectivisation led to numerous peasant revolts. The first five-year plan changed the output expected from Ukrainian farms, from the familiar crop of grain to unfamiliar crops like sugar beets and cotton. In addition, the situation was exacerbated by poor administration of the plan and the lack of relevant general management. Significant amounts of grain remained unharvested, and – even when harvested – a significant percentage was lost during processing, transportation, or storage. In the summer of 1930, the government instituted a program of food requisitioning, ostensibly to increase grain exports. Subsequently, in 1932, food theft was made punishable by death or 10 years imprisonment. At every [train] station there was a crowd of peasants in rags, offering ikons and linen in exchange against a loaf of bread. The women were lifting up their infants to the compartment windows – infants pitiful and terrifying with limbs like sticks, puffed bellies, big cadaverous heads lolling on thin necks. Map of depopulation of Ukraine and southern Russia, 1929–33. Territories in white were not part of the USSR during the famine. By the end of 1933, millions of people had starved to death or had otherwise died unnaturally in Ukraine and the other Soviet republics. 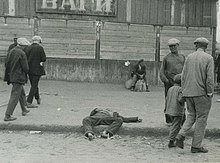 The total number of population losses (famine death and birth deficit) across the entire Soviet Union is estimated at 6–7 million. The Soviet Union long denied that the famine had taken place. The NKVD (and later KGB) archives on the Holodomor period made records available very slowly. The exact number of the victims remains unknown and is probably impossible to estimate, even within a margin of error of a hundred thousand. The media have reported estimates by historians of fatalities as high as seven to ten million. Former Ukrainian president Yushchenko stated in a speech to the United States Congress that the Holodomor "took away 20 million lives of Ukrainians", while former Canadian Prime Minister Stephen Harper issued a public statement giving the death toll at about 10 million. During an international conference, "Holodomor 1932-1933 loss of the Ukrainian nation", which took place on 4 October 2016 at the National University of Kiev Taras Shevchenko, it was claimed that during the holodmor 7 million Ukrainians were killed, and in total, 10 million people died of starvation in the entire USSR. David R. Marple in this vein gives a figure of 7.5 million. The use of the 7 to 20 million figures has been criticized by historians Timothy D. Snyder and Stephen G. Wheatcroft. Snyder wrote: "President Viktor Yushchenko does his country a grave disservice by claiming ten million deaths, thus exaggerating the number of Ukrainians killed by a factor of three; but it is true that the famine in Ukraine of 1932–1933 was a result of purposeful political decisions, and killed about three million people." In an email to Postmedia News, Wheatcroft wrote: "I find it regrettable that Stephen Harper and other leading Western politicians are continuing to use such exaggerated figures for Ukrainian famine mortality" and "There is absolutely no basis for accepting a figure of 10 million Ukrainians dying as a result of the famine of 1932–33." Estimates vary in their coverage, with some using the 1933 Ukraine borders, some of the current borders, and some counting ethnic Ukrainians. Some extrapolate on the basis of deaths in a given area, while others use archival data. Some historians question the accuracy of Soviet censuses, as they may reflect Soviet propaganda. Other estimates come from recorded discussions between world leaders. In an August 1942 conversation, Stalin gave Winston Churchill his estimates of the number of "kulaks" who were repressed for resisting collectivisation as 10 million, in all of the Soviet Union, rather than only in Ukraine. When using this number, Stalin implied that it included not only those who lost their lives but also those who were forcibly deported. Additionally, there are variations in opinion as to whether deaths in Gulag labour camps should be counted or only those who starved to death at home. The estimate prior to the opening of the former Soviet archives varied widely but the range was narrower: for example, 2.5 million (Volodymyr Kubiyovych), 4.8 million (Vasyl Hryshko) and 5 million (Robert Conquest). One modern calculation that uses demographic data, including those recently available from Soviet archives, narrows the losses to about 3.2 million or, allowing for the lack of precise data, 3 million to 3.5 million. Soviet archives show that excess deaths in Ukraine in 1932–1933 numbered a minimum of 1.8 million (2.7 including birth losses). This source further states "Depending upon the estimations made concerning unregistered mortality and natality, these figures could be increased to a level of 2.8 million to a maximum of 4.8 million excess deaths and to 3.7 million to a maximum of 6.7 million population losses (including birth losses)". In 1932–1933, there were 1.2 million cases of typhus and 500,000 cases of typhoid fever. Malnourishment increases fatality rates from many diseases, and are not counted by some historians. From 1932 to 1934, the largest rate of increase was recorded for typhus, commonly spread by lice. In conditions of harvest failure and increased poverty, lice are likely to increase. Gathering numerous refugees at railway stations, on trains and elsewhere facilitates the spread. In 1933, the number of recorded cases was 20 times the 1929 level. The number of cases per head of population recorded in Ukraine in 1933 was already considerably higher than in the USSR as a whole. By June 1933, incidence in Ukraine had increased to nearly 10 times the January level, and it was much higher than in the rest of the USSR. The number of recorded excess deaths extracted from the birth/death statistics from Soviet archives is contradictory. The data fail to add up to the differences between the results of the 1926 Census and the 1937 Census. Kulchytsky summarized the declassified Soviet statistics as showing a decrease of 538,000 people in the population of Soviet Ukraine between 1926 census (28,925,976) and 1937 census (28,388,000). According to the correction for officially non-accounted child mortality in 1933 by 150,000 calculated by Sergei Maksudov, the number of births for 1933 should be increased from 471,000 to 621,000 (down from 1,184,000 in 1927). Given the decreasing birth rates and assuming the natural mortality rates in 1933 to be equal to the average annual mortality rate in 1927–1930 (524,000 per year), a natural population growth for 1933 would have been 97,000 (as opposed to the recorded decrease of 1,379,000). This was five times less than the growth in the previous three years (1927–1930). The natural population growth from 1927 to 1936 should have been 4.043 million, while the census data showed a decrease of 538,000. The sum of the two numbers gives an estimated total demographic loss of 4.581 million people. A "Red Train" of carts from the "Wave of Proletarian Revolution" collective farm in the village of Oleksiyivka, Kharkiv oblast in 1932. "Red Trains" took the first harvest of the season's crop to the government depots. During the Holodomor, these brigades were part of the Soviet Government's policy of deliberately taking away food from the peasants. Estimates of the human losses due to famine must account for the numbers involved in migration (including forced resettlement). According to Soviet statistics, the migration balance for the population in Ukraine for 1927–1936 period was a loss of 1.343 million people. Even when the data were collected, the Soviet statistical institutions acknowledged that the precision was less than for the data of the natural population change. The total number of deaths in Ukraine due to unnatural causes for the given ten years was 3.238 million; accounting for the lack of precision, estimates of the human toll range from 2.2 million to 3.5 million deaths. A 2002 study by Vallin et al. utilising some similar primary sources to Kulchytsky, and performing an analysis with more sophisticated demographic tools with forward projection of expected growth from the 1926 census and backward projection from the 1939 census estimates the number of direct deaths for 1933 as 2.582 million. This number of deaths does not reflect the total demographic loss for Ukraine from these events as the fall of the birth rate during the crisis and the out-migration contribute to the latter as well. The total population shortfall from the expected value between 1926 and 1939 estimated by Vallin amounted to 4.566 million. Of this number, 1.057 million is attributed to the birth deficit, 930,000 to forced out-migration, and 2.582 million to the combination of excess mortality and voluntary out-migration. With the latter assumed to be negligible, this estimate gives the number of deaths as the result of the 1933 famine about 2.2 million. According to this study the life expectancy for those born in 1933 sharply fell to 10.8 years for females and to 7.3 years for males and remained abnormally low for 1934 but, as commonly expected for the post-crisis peaked in 1935–36. According to historian Snyder, the recorded figure of excess deaths was 2.4 million. However, Snyder claims that this figure is "substantially low" due to many deaths going unrecorded. 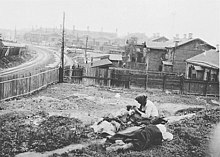 Snyder states that demographic calculations carried out by the Ukrainian government provide a figure of 3.89 million dead, and opined that the actual figure is likely between these two figures, approximately 3.3 million deaths to starvation and disease related to the starvation in Ukraine from 1932 to 1933. Snyder also estimates that of the million people who died in the Russian Soviet Federative Socialist Republic from famine at the same time, approximately 200,000 were ethnic Ukrainians due to Ukrainian-inhabited regions being particularly hard hit in Russia. As a child, Mikhail Gorbachev, born into a mixed Russian-Ukrainian family, experienced the famine in Stavropol, Russia. He recalled in a memoir that "In that terrible year [in 1933] nearly half the population of my native village, Privolnoye, starved to death, including two sisters and one brother of my father." According to one estimate, about 81.3% of the famine victims in the Ukrainian SSR were ethnic Ukrainians, 4.5% Russians, 1.4% Jews and 1.1% were Poles. Many Belarusians, Hungarians, Volga Germans and other nationalities became victims as well. The Ukrainian rural population was the hardest hit by the Holodomor. Since the peasantry constituted a demographic backbone of the Ukrainian nation, the tragedy deeply affected the Ukrainians for many years. In an October 2013 opinion poll (in Ukraine) 38.7% of those polled stated "my families had people affected by the famine", 39.2% stated they did not have such relatives, and 22.1% did not know. In response to the demographic collapse, the Soviet authorities ordered large-scale resettlements, with over 117,000 peasants from remote regions of the Soviet Union taking over the deserted farms. According to them [Davies and Wheatcroft], only taking an action whose sole objective is to cause deaths among the peasantry counts as intent. Taking an action with some other goal (e.g. exporting grain to import machinery) but which the actor certainly knows will also cause peasants to starve does not count as intentionally starving the peasants. However, this is an interpretation of 'intent' which flies in the face of the general legal interpretation. Genocide scholar Adam Jones stresses that many of the actions of the Soviet leadership during 1931–32 should be considered genocidal. Not only did the famine kill millions, it took place against "a backdrop of persecution, mass execution, and incarceration clearly aimed at undermining Ukrainians as a national group". Norman Naimark, a historian at Stanford University who specialises in many fields of modern European history, genocide and ethnic cleansing, argues that some of the actions of Stalin's regime, not only those during the Holodomor but also Dekulakization and targeted campaigns against particular ethnic groups (with over 110,000 shot) may be seen as genocidal. In 2006, the Security Service of Ukraine declassified more than 5,000 pages of Holodomor archives. These documents suggest that the Soviet regime singled out Ukraine by not giving it the same humanitarian aid given to regions outside it. The statistical distribution of famine's victims among the ethnicities closely reflects the ethnic distribution of the rural population of Ukraine. Moldavian, Polish, German, and Bulgarian population that mostly resided in the rural communities of Ukraine suffered in the same proportion as the rural Ukrainian population. Grain supplies were sufficient to sustain everyone if properly distributed. People died mostly of terror-starvation (excess grain exports, seizure of edibles from the starving, state refusal to provide emergency relief, bans on outmigration, and forced deportation to food-deficit locales), not poor harvests and routine administrative bungling. Timothy D. Snyder, professor of history at Yale University, asserts that in 1933 "Joseph Stalin was deliberately starving Ukraine" through a "heartless campaign of requisitions that began Europe's era of mass killing". He argues the Soviets themselves "made sure that the term genocide, contrary to Lemkin's intentions, excluded political and economic groups". Thus the Ukrainian famine can be presented as "somehow less genocidal because it targeted a class, kulaks, as well as a nation, Ukraine". William Henry Chamberlin was a Moscow correspondent of the Christian Science Monitor for 10 years; in 1934 he was reassigned to the Far East. After he left the Soviet Union he wrote his account of the situation in Ukraine and North Caucasus (Poltava, Bila Tserkva, and Kropotkin). Chamberlin later published a couple of books: Russia's Iron Age and The Ukraine: A Submerged Nation. He wrote in the Christian Science Monitor in 1934 that "the evidence of a large-scale famine was so overwhelming, was so unanimously confirmed by the peasants that the most 'hard-boiled' local officials could say nothing in denial". Holodomor denial is the assertion that the 1932–1933 genocide in Soviet Ukraine either did not occur or did occur but was not a premeditated act. 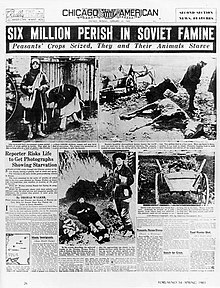 Denying the existence of the famine was the Soviet state's position and reflected in both Soviet propaganda and the work of some Western journalists and intellectuals including George Bernard Shaw, Walter Duranty, and Louis Fischer. In the Soviet Union, authorities all but banned discussion of the famine, and Ukrainian historian Stanislav Kulchytsky stated the Soviet government ordered him to falsify his findings and depict the famine as an unavoidable natural disaster, to absolve the Communist Party and uphold the legacy of Stalin. 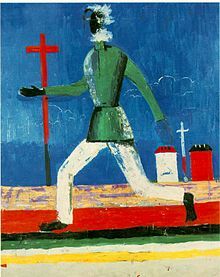 One of the interpretations of The Running Man painting by Kazimir Malevich, also known as Peasant Between a Cross and a Sword, is the artist's indictment of the Great Famine. "Kasimir Malevich's haunting 'The Running Man' (1933–34), showing a peasant fleeing across a deserted landscape, is eloquent testimony to the disaster." The famine is officially considered by the modern Ukrainian government to be an act of genocide. United States and Europe do not recognise it as such but consider that the Holodomor was an attack on the Ukrainian people. In 2007, President Viktor Yushchenko declared he wanted "a new law criminalising Holodomor denial," while Communist Party head Petro Symonenko said he "does not believe there was any deliberate starvation at all," and accused Yushchenko of "using the famine to stir up hatred." Few in Ukraine share Symonenko's interpretation of history and the number of Ukrainians who deny the famine or view it as caused by natural reasons is steadily falling. In the former Soviet Union millions of men, women and children fell victims to the cruel actions and policies of the totalitarian regime. The Great Famine of 1932–1933 in Ukraine (Holodomor), took from 7 million to 10 million innocent lives and became a national tragedy for the Ukrainian people. In this regard, we note activities in observance of the seventieth anniversary of this Famine, in particular organized by the Government of Ukraine. Honouring the seventieth anniversary of the Ukrainian tragedy, we also commemorate the memory of millions of Russians, Kazakhs and representatives of other nationalities who died of starvation in the Volga River region, Northern Caucasus, Kazakhstan and in other parts of the former Soviet Union, as a result of civil war and forced collectivisation, leaving deep scars in the consciousness of future generations. Nationwide, the political repression of 1937 (The Great Purge), under the guidance of Nikolai Yezhov, was known for its ferocity and ruthlessness, but Lev Kopelev wrote, "In Ukraine 1937 began in 1933," referring to the comparatively early beginning of the Soviet crackdown in Ukraine. While the famine was well documented at the time by journalist Gareth Jones, its reality has been disputed for ideological reasons. An example of a late-era Holodomor objector is Canadian trade union activist and journalist Douglas Tottle, author of Fraud, Famine and Fascism: The Ukrainian Genocide Myth from Hitler to Harvard (published by Moscow-based Communist publisher Progress Publishers in 1987). Tottle claims that while there were severe economic hardships in Ukraine, the idea of the Holodomor was fabricated as propaganda by Nazi Germany and William Randolph Hearst to justify a German invasion. On 26 April 2010, newly elected Ukrainian President Viktor Yanukovych told Parliamentary Assembly of the Council of Europe members that Holodomor was a common tragedy that struck Ukrainians and other Soviet peoples, and it would be wrong to recognise the Holodomor as an act of genocide against one nation. He stated that "The Holodomor was in Ukraine, Russia, Belarus, and Kazakhstan. It was the result of Stalin's totalitarian regime. But it would be wrong and unfair to recognise the Holodomor as an act of genocide against one nation." He has, however, referred to it as a crime, a tragedy, and an Armageddon, while maintaining use of the word "Holodomor" to describe the event. In response to Yanukovych's statements, the Our Ukraine Party alleged that Yanukovych directly violated Ukrainian law, which defines the Holodomor as genocide against the Ukrainian people and makes the public denial of the Holodomor unlawful. Our Ukraine Party also asserted that Yanukovych "ignored a ruling of 13 January 2010 by Kiev's Court of Appeal, which recognized the leaders of the totalitarian Bolshevik regime as those guilty of 'genocide against the Ukrainian national group in 1932–33 through the artificial creation of living conditions intended for its partial physical destruction.'" In 2012, Yanukovych referred to the Holodomor as a crime which caused fear and obedience. 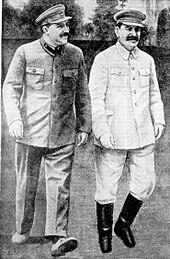 Lazar Kaganovich (left) played a role in enforcing Stalin's policies that led to the Holodomor. On 23 October 2008, the European Parliament adopted a resolution that recognised the Holodomor as a crime against humanity. On 27 April 2010, a draft Parliamentary Assembly of the Council of Europe resolution declared the famine was caused by the "cruel and deliberate actions and policies of the Soviet regime" and was responsible for the deaths of "millions of innocent people" in Ukraine, Belarus, Kazakhstan, Moldova, and Russia. Even though PACE found Stalin guilty of causing the famine, it rejected several amendments to the resolution, which proposed the Holodomor be recognized as an act of genocide against the Ukrainian people. On 28 November 2006, the Verkhovna Rada (Ukrainian Parliament) passed a law defining the Holodomor as a deliberate act of genocide and made public denial illegal. Even though in April 2010 newly elected president Yanukovych reversed Yushchenko's position on the Holodomor famine, the law has not been repealed and remains in force. On 12 January 2010, the court of appeals in Kiev opened hearings into the "fact of genocide-famine Holodomor in Ukraine in 1932–33". In May 2009, the Security Service of Ukraine started a criminal case "in relation to the genocide in Ukraine in 1932–33". In a ruling on 13 January 2010, the court found Joseph Stalin and other Bolshevik leaders guilty of genocide against the Ukrainians. The court dropped criminal proceedings against the leaders: Stalin, Vyacheslav Molotov, Lazar Kaganovich, Stanislav Kosior, Pavel Postyshev, Vlas Chubar and others, who all had died years before. This decision became effective on 21 January 2010. The joint statement at the United Nations in 2003 has defined the famine as the result of actions and policies of the totalitarian regime that caused the deaths of millions of Ukrainians, Russians, Kazakhs and other nationalities in the USSR. As of March 2008, more than 10 countries have officially recognised the actions of the Soviet government as an act of genocide. To honour those who perished in the Holodomor, monuments have been dedicated and public events held annually in Ukraine and worldwide. Since 2006 Ukraine has officially observed a Holodomor Memorial Day on the fourth Saturday of November. In 2006, the Holodomor Remembrance Day took place on 25 November. Ukraine President Viktor Yushchenko directed, in Decree No. 868/2006, that a minute of silence should be observed at 4 o'clock in the afternoon on that Saturday. The document specified that flags in Ukraine should fly at half-staff as a sign of mourning. In addition, the decree directed that entertainment events are to be restricted and television and radio programming adjusted accordingly. In 2007, the 74th anniversary of the Holodomor was commemorated in Kiev for three days on the Maidan Nezalezhnosti. As part of the three-day event, from 23 to 25 November, video testimonies of the communist regime's crimes in Ukraine, and documentaries by famous domestic and foreign film directors were shown. In addition, experts and scholars gave lectures on the topic. As well, on 23 November 2007, the National Bank of Ukraine issued a set of two commemorative coins remembering the Holodomor. As of 2009, Ukrainian schoolchildren take a more extensive course of the history of the Holodomor. The National Museum "Memorial to Holodomor victims" was erected on the slopes of the Dnieper river in 2008, welcoming its first visitors on 22 November 2008. The ceremony of the memorial's opening was dedicated to the 75th anniversary of the Holodomor. In an October 2013 opinion poll, 33.7% of Ukrainians fully agreed and 30.4% rather agreed with the statement "The Holodomor was the result of actions committed by the Soviet authorities, along with Soviet dictator Joseph Stalin, and was the result of human actions". In the same poll, 22.9% of those polled fully or partially agreed with the view that the famine was caused by natural circumstances, but 50.5% disagreed with that. Furthermore, 45.4% of respondents believed that the Holodomor was "a deliberate attempt to destroy the Ukrainian nation" and 26.2% rather or completely disagreed with this. The first public monument to the Holodomor was erected and dedicated in 1983 outside City Hall in Edmonton, Alberta, Canada, to mark the 50th anniversary of the famine-genocide. Since then, the fourth Saturday in November has in many jurisdictions been marked as the official day of remembrance for people who died as a result of the 1932–33 Holodomor and political repression. On 22 November 2008, Ukrainian Canadians marked the beginning of National Holodomor Awareness Week. Citizenship, Immigration, and Multiculturalism Minister Jason Kenney attended a vigil in Kiev. In November 2010, Prime Minister Stephen Harper visited the Holodomor memorial in Kiev, although Ukrainian President Viktor Yanukovych did not join him. Saskatchewan became the first jurisdiction in North America and the first province in Canada to recognize the Holodomor as a genocide. The Ukrainian Famine and Genocide (Holodomor) Memorial Day Act was introduced in the Saskatchewan Legislature on 6 May 2008, and received royal assent on 14 May 2008. On 9 April 2009, the Province of Ontario unanimously passed bill 147, "The Holodomor Memorial Day Act", which calls for the fourth Saturday in November to be a day of remembrance. This was the first piece of legislation in the Province's history to be introduced with Tri-Partisan sponsorship: the joint initiators of the bill were Dave Levac, MPP for Brant (Liberal Party); Cheri DiNovo, MPP for Parkdale–High Park (NDP); and Frank Klees, MPP for Newmarket–Aurora (PC). MPP Levac was made a chevalier of Ukraine's Order of Merit. On 2 June 2010, the Province of Quebec unanimously passed bill 390, "Memorial Day Act on the great Ukrainian famine and genocide (the Holodomor)". On 25 September 2010, a new Holodomor monument was unveiled at St. Mary's Ukrainian Catholic Church, Mississauga, Ontario, Canada, bearing the inscription "Holodomor: Genocide By Famine in Ukraine 1932–1933" and a section in Ukrainian bearing mention of the 10 million victims. On 21 September 2014, a statue entitled "Bitter Memories of Childhood" was unveiled outside the Manitoba Legislature Building in Winnipeg. A monument to the Holodomor has been erected on Calgary's Memorial Drive, itself originally designated to honour Canadian servicemen of the First World War. The monument is located in the district of Renfrew near Ukrainian Pioneer Park, which pays tribute to the contributions of Ukrainian immigrants to Canada. The Ukrainian Weekly reported a meeting taking place on 27 February 1982 in the parish center of the Ukrainian Catholic National Shrine of the Holy Family in commemoration of the 50th Anniversary of the Great Famine caused by the Soviet authorities. On 20 March 1982, the Ukrainian Weekly also reported a multi-ethnic community meeting that was held on 15 February on the North Shore Drive at the Ukrainian Village in Chicago to commemorate the famine which took the lives of seven million Ukrainians. Other events in commemoration were held in other places around the United States as well. On 29 May 2008, the city of Baltimore held a candlelight commemoration for the Holodomor at the War Memorial Plaza in front of City Hall. This ceremony was part of the larger international journey of the "International Holodomor Remembrance Torch", which began in Kiev and made its way through thirty-three countries. Twenty-two other US cities were also visited during the tour. Then-Mayor Sheila Dixon presided over the ceremony and declared 29 May to be "Ukrainian Genocide Remembrance Day in Baltimore". She referred to the Holodomor "among the worst cases of man's inhumanity towards man". On 2 December 2008, a ceremony was held in Washington, D.C., for the Holodomor Memorial. On 13 November 2009, U.S. President Barack Obama released a statement on Ukrainian Holodomor Remembrance Day. In this, he said that "remembering the victims of the man-made catastrophe of Holodomor provides us an opportunity to reflect upon the plight of all those who have suffered the consequences of extremism and tyranny around the world". NSC Spokesman Mike Hammer released a similar statement on 20 November 2010. In 2011, the U.S. day of remembrance of Holodomor was held on 19 November. The statement released by the White House Press Secretary reflects on the significance of this date, stating: "... in the wake of this brutal and deliberate attempt to break the will of the people of Ukraine, Ukrainians showed great courage and resilience. The establishment of a proud and independent Ukraine twenty years ago shows the remarkable depth of the Ukrainian people's love of freedom and independence." On 7 November 2015, the Holodomor Genocide Memorial was opened in Washington D.C., District of Columbia, USA. A monument has been erected in the city of Lublin. A touring van devoted to Holodomor education, seen in Hamilton, Ontario, Canada, in 2017. Monument in Kiev, called "The Bitter Memory of Childhood"
Monument dedicated to victims of years 1932-33 famine in Vyshhorod, Ukraine. The authors are Boris Krylov and Oles Sydoruk. Ulas Samchuk's novel Maria (1934) is dedicated to holodomor, (English translation, Maria. A Chronicle of a Life 1952). National Museum "Memorial to Holodomor victims"
^ Also known as "Extermination by hunger" or "Hunger-extermination"
^ Davies & Wheatcroft 2010, pp. 479–484. ^ Jones, Adam (2010). Genocide: A Comprehensive Introduction. Taylor & Francis. p. 194. ISBN 978-0-415-48618-7. ^ Graziosi, Andrea (2005). LES FAMINES SOVIÉTIQUES DE 1931–1933 ET LE HOLODOMOR UKRAINIEN. Cahier du Monde Russe. p. 464. ^ Davies 2006, p. 145. ^ Baumeister 1999, p. 179. ^ Sternberg & Sternberg 2008, p. 67. ^ "Ukrainian Genocide of 1932–1933". Ukrainian Genocide Famine Foundation – USA, Inc. Archived from the original on 24 November 2016. Retrieved 22 November 2016. ^ a b "The famine of 1932–33". Encyclopædia Britannica online. Archived from the original on 23 November 2015. Retrieved 2 November 2015. The Great Famine (Holodomor) of 1932–33 – a man-made demographic catastrophe unprecedented in peacetime. Of the estimated six to eight million people who died in the Soviet Union, about four to five million were Ukrainians ... Its deliberate nature is underscored by the fact that no physical basis for famine existed in Ukraine ... Soviet authorities set requisition quotas for Ukraine at an impossibly high level. Brigades of special agents were dispatched to Ukraine to assist in procurement, and homes were routinely searched and foodstuffs confiscated ... The rural population was left with insufficient food to feed itself. ^ ЗАКОН УКРАЇНИ: Про Голодомор 1932–1933 років в Україні [LAW OF UKRAINE: About the Holodomor of 1932–1933 in Ukraine]. rada.gov.ua (in Ukrainian). 28 November 2006. Archived from the original on 3 May 2015. Retrieved 6 May 2015. ^ "International Recognition of the Holodomor". Holodomor Education. Archived from the original on 31 December 2015. Retrieved 26 December 2015. ^ a b Wheatcroft 2001a. ^ Snyder 2010, p. 53. "It seems reasonable to propose a figure of approximately 3.3 million deaths by starvation and hunger-related disease in Soviet Ukraine in 1932–1933". ^ Наливайченко назвал количество жертв голодомора в Украине [Nalyvaichenko called the number of victims of Holodomor in Ukraine] (in Russian). LB.ua. 14 January 2010. Archived from the original on 24 April 2012. Retrieved 21 July 2012. ^ Davies & Wheatcroft 2002, p. 77. "[T]he drought of 1931 was particularly severe, and drought conditions continued in 1932. This certainly helped to worsen the conditions for obtaining the harvest in 1932". ^ Engerman 2003, p. 194. ^ Zisels, Josef; Halyna Kharaz (11 November 2007). "Will Holodomor receive the same status as the Holocaust?". world.maidan.org.ua. Archived from the original on 28 June 2007. Retrieved 21 July 2012. ^ Mytsyk, Y. A. (2003). Трагедія Голодомору у спогадах очевидців [The tragedy of the Holodomor in the memories of eyewitnesses]. archives.gov.ua. ISBN 978-966-518-210-8. Archived from the original on 18 February 2007. Retrieved 9 December 2015. ^ Stanislav Kulchytsky (2 September 2008). "The Holodomor of 1932–1933: the scholarly verdict". day.kiev.ua. Archived from the original on 9 January 2016. Retrieved 9 December 2015. ^ a b c d Margolis, Eric. "Seven million died in the 'forgotten' holocaust". ukemonde.com. Archived from the original on 9 September 2017. Retrieved 8 October 2017. ^ Davies, Robert; Wheatcroft, Stephen (2009). The Industrialisation of Soviet Russia Volume 5: The Years of Hunger: Soviet Agriculture 1931–1933. Palgrave Macmillan UK. p. xiv. ISBN 978-0-230-27397-9. Retrieved 15 June 2017. ^ Tauger, Mark B. (2001). "Natural Disaster and Human Actions in the Soviet Famine of 1931–1933". The Carl Beck Papers in Russian and East European Studies (1506): 1–65. doi:10.5195/CBP.2001.89. ISSN 2163-839X. Archived from the original on 12 June 2017. ^ Werth 2010, p. 396. ^ a b Fawkes, Helen (24 November 2006). "Legacy of famine divides Ukraine". BBC News. Archived from the original on 28 March 2012. Retrieved 21 July 2012. ^ Applebaum, Anne (2017). Red Famine: Stalin's War on Ukraine. New York: Doubleday. p. 363. ISBN 9780385538855. ^ Hadzewycz, Zarycky & Kolomayets 1983. ^ Bilinsky, Yaroslav (July 1983). "Shcherbytskyi, Ukraine, and Kremlin Politics". Problems of Communism. Archived from the original on 2 February 2014. ^ Graziosi, Andrea (2004–2005). "The Soviet 1931–1933 Famines and the Ukrainian Holodomor: Is a New Interpretation Possible, and What Would Its Consequences Be?". Harvard Ukrainian Studies. 27 (1–4): 97–115. JSTOR 41036863. ^ U.S. Commission on the Ukraine Famine (1988). Investigation of the Ukrainian Famine 1932–1933. Washington, D.C.: United States Government Printing Office. p. 67. Archived from the original on 7 January 2007. Retrieved 27 July 2012. ^ Mace 2008, p. 132. ^ Vyacheslav T. Busel, ed. (2001). Великий тлумачний словник сучасної української мови:- Голодомор [Great Explanatory Dictionary of Modern Ukrainian:- Holodomor] (in Ukrainian). Irpin, Perun (2004). ISBN 978-966-569-013-9. Archived from the original on 3 June 2016. Retrieved 29 February 2016. Artificial famine organised on a vast scale by criminal authorities against the population of their own country. ^ ""Голодомор 1932–33 років в Україні: документи і матеріали"/ Упорядник Руслан Пиріг; НАН України.Ін-т історії України.-К. :Вид.дім "Києво-Могилянська академія", "Famine in Ukraine 1932–33: documents and materials / compiled by Ruslan Pyrig National Academy of Sciences of Ukraine. Institute of History of Ukraine. -K.:section Kiev-Mohyla Academy 2007". Archives.gov.ua. Archived from the original on 15 August 2012. Retrieved 7 September 2012. ^ Davies & Wheatcroft 2010, p. 204. ^ "University of Toronto Data Library Service". Archived from the original on 6 July 2011. ^ "Demoscope Weekly". Archived from the original on 19 January 2012. ^ Davies & Wheatcroft 2010, p. 470, 476. ^ Davies & Wheatcroft 2010, p. xviii. ^ Холодомор – 2009 Archived 24 July 2011 at the Wayback Machine. Retrieved 6 November 2010. ^ "Голод 1932–1933 років на Україні: очима істориків, мовою документів". Archives.gov.ua. Archived from the original on 15 August 2012. Retrieved 7 September 2012. ^ Сокур, Василий [Sokur, Vasily] (21 November 2008). Выявленным во время голодомора людоедам ходившие по селам медицинские работники давали отравленные "приманки" – кусок мяса или хлеба. Facts and Commentaries (in Russian). Archived from the original on 6 January 2013. Retrieved 27 July 2012. The author suggests that never in the history of mankind was cannibalism so widespread as during the Holodomor. ^ Várdy & Várdy 2007. ^ Boriak, Hennadii (November 2008). "Holodomor Archives and Sources: The State of the Art" (PDF). The Harriman Review. 16 (2): 30. Archived from the original (PDF) on 12 December 2011. ^ David Marples (30 November 2005). "The great famine debate goes on ..." Edmonton Journal. ExpressNews, University of Alberta. Archived from the original on 15 June 2008. ^ a b Reid, Anna (7 October 2017). "Rule by Starvation". Wall Street Journal. Archived from the original on 8 October 2017. Retrieved 8 October 2017. (Subscription required (help)). ^ Peter Finn (27 April 2008). "Aftermath of a Soviet Famine". WashingtonPost.com. Archived from the original on 5 November 2012. Retrieved 21 July 2012. There are no exact figures on how many died. Modern historians place the number between 2.5 million and 3.5 million. Yushchenko and others have said at least 10 million were killed. ^ David Marples (30 November 2005). "The Great Famine Debate Goes On ..." Edmonton Journal. Archived from the original on 15 April 2009. Retrieved 21 July 2012. ^ Kulchytsky, Stanislav. "Holodomor-33: Why and how?". Zerkalo Nedeli (25 November – 1 December 2006). Russian version. ^ a b Snyder 2010, pp. 42–46. ^ The term anodyne administrative measure in the quote means a measure that was not meant to solve the problem but to calm the hungry crowds, or a measure which, in of itself, would not create opposition (See wikt:anodyne). The term 'Anodyne' refers to pain relieving methods, drugs or remedies, used prior to the 20th century. ^ Shifman, Misha (2015). Physics In A Mad World. London: World Scientific. p. 15. ISBN 9789814619288. ^ Marton, Kati (2007). Great Escape. New York: Simon and Schuster. p. 98. ISBN 9780743261159. ^ Wheatcroft 2001b, p. 885. ^ Valeriy Soldatenko (2003). Голодный тридцать третий субъективные мысли об объективных процессах [The starvation of '33: subjective thoughts about objective processes]. Zerkalo Nedeli (in Russian) (24, 28 June – 4 July). Archived from the original on 11 November 2004. Valeriy Soldatenko (2003). Голодний тридцять третій суб'єктивні думки про об'єктивні процеси [The starvation of '33: subjective thoughts about objective processes]. Zerkalo Nedeli (in Ukrainian) (24, 28 June – 4 July). Archived from the original on 13 March 2007. ^ a b Sheeter, Laura (24 November 2007). "Ukraine remembers famine horror". BBC News. Archived from the original on 31 July 2012. Retrieved 21 July 2012. ^ Kulchytsky, Stanislav (22 August 2003). Причины голода 1933 года в Украине по страницам одной подзабытой книги [Reasons for the 1933 famine in Ukraine according to the pages of one all but forgotten book]. Zerkalo Nedeli (in Russian) (16). Archived from the original on 14 January 2006. Retrieved 25 July 2012. During the hearings, the Ukrainian politician Stefan Khmara said, 'I would like to address the scientists, particularly, Stanislav Kulchytsky, who attempts to mark down the number of victims and counts them as 3–3.5 million. I studied these questions analysing the demographic statistics as early as in 1970s and concluded that the number of victims was no less than 7 million'. ^ Yushchenko, Viktor (27 November 2007). "Holodomor". The Wall Street Journal. Archived from the original on 8 September 2008. Retrieved 21 July 2012. ^ "Ukrainian President Yushchenko: Yushchenko's Address before Joint Session of U.S. Congress". Official Website of President of Ukraine. 6 April 2005. Archived from the original on 6 October 2006. Retrieved 7 September 2012. ^ a b "Harper accused of exaggerating Ukrainian genocide death toll". MontrealGazette.com. 30 October 2010. Archived from the original on 1 August 2012. Retrieved 21 July 2012. ^ a b "Holocaust: The ignored reality". Eurozine. 25 June 2009. Archived from the original on 11 April 2010. Retrieved 22 November 2010. ^ "Міжнародна конференція «Голодомор 1932 – 1933 років: втрати української нації»". КНУ імені Тараса Шевченка. 2016. Archived from the original on 6 September 2017. ^ a b c d e f g Stanislav Kulchytsky, "How many of us perished in Holodomor in 1933", Zerkalo Nedeli, 23–29 November 2002. Available online "in Russian". Archived from the original on 21 July 2006. Retrieved 10 January 2003. and "in Ukrainian". Archived from the original on 5 May 2006. Retrieved 1 February 2003. ^ "Stalislav Kulchytsky, "Demographic losses in Ukrainian in the twentieth century"". Archived from the original on 21 July 2006. Retrieved 8 January 2014. , Zerkalo Nedeli, 2–8 October 2004 (in Russian), and "(in Ukrainian)". Archived from the original on 13 March 2007. Retrieved 8 January 2014. ^ Kulchytsky & Yefimenko 2003, pp. 42–63. ^ Davies & Wheatcroft 2010, p. 429. ^ Davies & Wheatcroft 2010, p. 512. ^ a b Vallin et al. 2002. ^ Meslé, Pison & Vallin 2005, "What is striking in the long-term picture of Ukrainian life expectancy is the devastating impact of the calamities of the 1930s and 1940s. In 1933, the famine which had occasioned unparalleled excess mortality of 2.2 million, cut the period life expectancy to a low of under 10 years". ^ a b c d e "Poll: Almost two-thirds of Ukrainians believe famine of 1932–1933 was organized by Stalinist regime". Interfax-Ukraine. 20 November 2013. Archived from the original on 4 March 2016. Retrieved 28 February 2016. ^ "Post-holodomor Population Resettlements to Ukraine (1933–1934)". citation.allacademic.com. Archived from the original on 9 January 2016. Retrieved 15 June 2015. ^ Conquest, Robert (1986). The Harvest of Sorrow: Soviet Collectivization and the Terror-famine. Oxford University Press. ISBN 978-0195040548. ^ Davies & Wheatcroft 2006. ^ a b c d Ellman 2007. ^ Jones 2010, pp. 136–7. ^ "FSI/CISAC – Norman M. Naimark, MS, PhD". Cisac.fsi.stanford.edu. Archived from the original on 11 March 2016. Retrieved 28 February 2016. ^ Naimark 2010, pp. 133–135. ^ "Служба безпеки України". Ssu.kmu.gov.ua. Retrieved 7 September 2012. ^ "SBU documents show that Moscow singled out Ukraine in famine". 5 Kanal. 22 November 2006. Archived from the original on 27 September 2007. Retrieved 22 July 2012. ^ a b Kulchytsky & Yefimenko 2003, pp. 63–72. ^ Marples 2007, p. 64. ^ Rosefielde 2009, p. 259. ^ Snyder 2010, p. vii. ^ Snyder 2010, p. 413. ^ Lemkin, Raphael (1953). "Soviet Genocide in the Ukraine" (PDF). Archived from the original (PDF) on 2 March 2012. Retrieved 22 July 2012. Raphael Lemkin Papers, The New York Public Library, Manuscripts and Archives Division, Astor, Lenox and Tilden Foundation, Raphael Lemkin ZL-273. Reel 3. Published in L.Y. Luciuk (ed), Holodomor: Reflections on the Great Famine of 1932–1933 in Soviet Ukraine (Kingston: The Kashtan Press, 2008). ^ William Henry Chamberlin. "The Ukraine: A Submerged Nation, published in 1944". Openlibrary.org. Retrieved 7 September 2012. ^ "What Is the Ukraine Famine Disaster of 1932–1933?". semp.us. 2 January 2005. Archived from the original on 9 November 2007. ^ Chamberlin, William Henry (20 March 1983). "Famine proves potent weapon in Soviet policy" (PDF). The Ukrainian Weekly. 51 (12): 6. Archived (PDF) from the original on 1 March 2012. Retrieved 22 July 2012. ^ a b Radzinsky 1996, pp. 256–9. ^ Conquest 2001, p. 96. ^ Pipes 1995, pp. 232–6. ^ Editorial (14 July 2002). "Famine denial" (PDF). The Ukrainian Weekly. 70 (28): 6. Archived (PDF) from the original on 3 December 2013. Retrieved 22 July 2012. ^ Mace 2004, p. 93. ^ Century of Genocide: Critical Essays and Eyewitness Accounts. p. 93. ISBN 978-0-415-94429-8. ^ Levy, Clifford (15 March 2009). "A New View of a Famine That Killed Millions". New York Times. Archived from the original on 20 March 2017. ^ Dmytro Horbachov (1998). "Fullest Expression of Pure Feeling". Welcome to Ukraine (1). Archived from the original on 3 March 2016. Retrieved 25 January 2016. ^ Wilson 2002, p. 144. ^ a b "30 U.N. member-states sign joint declaration on Great Famine" (PDF). The Ukrainian Weekly. 71 (46): 1, 20. 16 November 2003. Archived (PDF) from the original on 3 March 2014. Retrieved 22 July 2012. ^ Subtelny 2002, p. 418. ^ Interfax-Ukraine (27 April 2010). "Yanukovych: Famine of 1930s was not genocide against Ukrainians". KyivPost.com. Archived from the original on 24 July 2014. Retrieved 21 July 2012. ^ a b Motyl, Alexander J. (29 November 2012). "Yanukovych and Stalin's Genocide". World Affairs. Archived from the original on 4 December 2012. Retrieved 2 December 2012. ^ a b Interfax-Ukraine (27 April 2010). "Our Ukraine Party: Yanukovych violated law on Holodomor of 1932–1933". KyivPost.com. Archived from the original on 3 March 2014. Retrieved 22 July 2012. ^ "Commemoration of the Holodomor, the artificial famine in Ukraine (1932–1933)". European Parliament. 23 October 2008. Archived from the original on 8 October 2012. Retrieved 22 July 2012. ^ "European Parliament resolution of 23 October 2008 on the commemoration of the Holodomor, the Ukraine artificial famine (1932–1933)". European Parliament. 23 October 2008. Archived from the original on 3 November 2012. Retrieved 21 July 2012. ^ a b "Yanukovych reverses Ukraine's position on Holodomor famine". RIA Novosti. 27 April 2010. Archived from the original on 9 January 2016. Retrieved 22 July 2012. ^ "PACE finds Stalin regime guilty of Holodomor, does not recognize it as genocide". RIA Novosti. 28 April 2010. Archived from the original on 21 July 2015. Retrieved 21 July 2012. ^ Mordini & Green 2009, p. x. ^ Pourchot 2008, p. 98. ^ Interfax-Ukraine (12 January 2010). "Holodomor court hearings begin in Ukraine". KyivPost.com. Archived from the original on 3 March 2014. Retrieved 21 July 2012. ^ "Yushchenko brings Stalin to court over genocide". RT.com. 14 January 2010. Archived from the original on 9 January 2016. Retrieved 25 January 2016. ^ Interfax-Ukraine (21 January 2010). "Sentence to Stalin, his comrades for organizing Holodomor takes effect in Ukraine". KyivPost.com. Archived from the original on 3 March 2014. Retrieved 21 July 2012. ^ AnydayGuide. "Remembrance Day for the Victims of Holodomors in Ukraine / November 25, 2017". Archived from the original on 1 December 2017. Retrieved 24 November 2017. ^ Rud, Victor. "Holodomor Remembrance Day: Why the Past Matters for the Future". Archived from the original on 1 December 2017. Retrieved 24 November 2017. ^ Marcel Van Herpen (2013). Putinism: The Slow Rise of a Radical Right Regime in Russia. Palgrave Macmillan UK. p. 40. ISBN 978-1-137-28282-8. Retrieved 29 February 2016. ^ "Schoolchildren to study in detail about Holodomor and OUN-UPA". ZIK–Western Information Agency. 12 June 2009. Archived from the original on 22 April 2012. Retrieved 22 July 2012. ^ National Museum: Memorial in Commemoration of Famines' Victims in Ukraine, History of the Museum "Archived copy". Archived from the original on 17 February 2013. Retrieved 2 August 2013. CS1 maint: Archived copy as title (link) Kiev, 2012. Retrieved on 2 August 2013. ^ "Ukrainian-Canadians mark famine's 75th anniversary". CTV.ca. 22 November 2008. Archived from the original on 18 October 2012. Retrieved 22 July 2012. ^ "Saskatchewan recognises genocide during Holodomor Remembrance Week | News and Media | Government of Saskatchewan". Saskatchewan.ca. 14 November 2013. Archived from the original on 6 May 2015. Retrieved 6 May 2015. ^ "Saskatchewan first province to recognize Holodomor as genocide" (PDF). XXII (2). Visnyk. 2008. Archived (PDF) from the original on 14 July 2014. Retrieved 6 May 2015. ^ "Holodomor". Ucc.sk.ca. 2008. Archived from the original on 5 March 2016. Retrieved 6 May 2015. ^ "Ontario MPP gets Ukrainian knighthood for bill honouring victims of famine". The Canadian Press. 20 November 2010. Archived from the original on 19 May 2015. Retrieved 22 July 2012. ^ "Quebec Passes Bill Recognizing Holodomor as a Genocide". Ukrainian Canadian Congress. 3 June 2010. Archived from the original on 12 February 2013. Retrieved 22 July 2012. ^ "Holodomor Monument – Пам'ятник Голодомору 1932–33". St. Mary's Ukrainian Catholic Church. Archived from the original on 6 January 2013. Retrieved 22 July 2012. ^ "Unveiling of the Holodomor monument "Bitter Memories of Childhood"". UkrainianWinnipeg.ca. 22 September 2014. Archived from the original on 8 January 2017. Retrieved 22 November 2016. ^ Berg, Tabitha (6 June 2008). "International Holodomor Remembrance Torch in Baltimore Commemorates Ukrainian Genocide". eNewsChannels. Archived from the original on 5 January 2010. Retrieved 22 July 2012. ^ Bihun, Yaro (7 December 2008). "Site of Ukrainian Genocide Memorial in D.C. is dedicated" (PDF). The Ukrainian Weekly. 76 (49): 1, 8. Archived (PDF) from the original on 2 March 2014. Retrieved 22 July 2012. ^ "Remembrance of Holodomor in Ukraine will help prevent such tragedy in future, says Obama". Interfax-Ukraine. 14 November 2009. Archived from the original on 1 March 2014. Retrieved 22 July 2012. ^ "Statement by the NSC Spokesman Mike Hammer on Ukraine's Holodomor Remembrance Day". WhiteHouse.gov. 20 November 2010. Archived from the original on 21 October 2012. Retrieved 22 July 2012. ^ "Statement by the Press Secretary on Ukrainian Holodomor Remembrance Day". WhiteHouse.gov. 19 November 2011. Archived from the original on 23 November 2011. Retrieved 22 July 2012. ^ "Holodomor Memorial presented in Washington". UNIAN. 5 August 2015. Archived from the original on 17 November 2015. Retrieved 7 November 2015. ^ Andrea K. McDaniels (7 November 2015). "Organizers, including Timonium man, hope to educate with Ukrainian memorial in D.C." The Baltimore Sun. Archived from the original on 17 November 2015. Retrieved 7 November 2015. ^ "Odsłonięto pomnik ofiar Wielkiego Głodu na Ukrainie" [Monument unveiled to victims of the Great Famine in Ukraine]. wPolityce.pl (in Polish). 22 January 2015. Archived from the original on 22 November 2016. Retrieved 22 November 2016. Baumeister, Roy (1999). Evil: Inside Human Violence and Cruelty. New York: Henry Holt and Company. ISBN 978-0-8050-7165-8. Bilinsky, Yaroslav (1999). "Was the Ukrainian Famine of 1932–1933 Genocide?". Journal of Genocide Research. 1 (2): 147–156. doi:10.1080/14623529908413948. Conquest, Robert (1999). "Comment on Wheatcroft". Europe-Asia Studies. 51 (8): 1479–1483. doi:10.1080/09668139998426. JSTOR 153839. Conquest, Robert (2001). Reflections on a Ravaged Century (New ed.). New York, NY: W. W. Norton & Company. ISBN 978-0-393-32086-2. Conquest, Robert (2002) . The Harvest Of Sorrow: Soviet Collectivisation and the Terror-Famine. London: Pimlico. ISBN 978-0-7126-9750-7. Davies, Robert W.; Wheatcroft, Stephen G. (2002). "The Soviet Famine of 1932–33 and the Crisis in Agriculture" (PDF). In Stephen G. Wheatcroft. Challenging Traditional Views of Russian History. Houndmills: Palgrave Macmillan. ISBN 978-0-333-75461-0. Davies, Robert W.; Wheatcroft, Stephen G. (2006). "Stalin and the Soviet Famine of 1932–33: A Reply to Ellman" (PDF). Europe-Asia Studies. 58 (4): 625–633. doi:10.1080/09668130600652217. JSTOR 20451229. Davies, Robert W.; Wheatcroft, Stephen G. (2010). The Years of Hunger: Soviet Agriculture 1931–1933. Houndmills: Palgrave Macmillan. ISBN 978-0-230-23855-8. Davies, Norman (2006). Europe East and West. London: Jonathan Cape. ISBN 978-0-224-06924-3. Dolot, Miron (1985). Execution by Hunger: The Hidden Holocaust. New York, NY: W. W. Norton & Company. ISBN 978-0-393-30416-9. Ellman, Michael (2005). "The Role of Leadership Perceptions and of Intent in the Soviet Famine of 1931–1934" (PDF). Europe-Asia Studies. 57 (6): 823–41. doi:10.1080/09668130500199392. Ellman, Michael (2007). "Stalin and the Soviet Famine of 1932–33 Revisited" (PDF). Europe-Asia Studies. 59 (4): 663–693. doi:10.1080/09668130701291899. Engerman, David (2003). Modernization from the Other Shore: American Intellectuals and the Romance of Russian Development. Cambridge, MA: Harvard University Press. ISBN 978-0-674-01151-9. Hadzewycz, Roma; Zarycky, George B.; Kolomayets, Martha, eds. (1983). The Great Famine in Ukraine: The Unknown Holocaust. Jersey City, NJ: Ukrainian National Association. Hryshko, Vasyl (1978). Ukrains'kyi 'Holokast', 1933. New York, NY: DOBRUS; Toronto: SUZHERO. Jones, Adam (2010). Genocide: A Comprehensive Introduction (2nd ed.). Milton Park: Routledge. ISBN 978-0-415-48619-4. (in Ukrainian) Kulchytsky, Stanislav; Yefimenko, Hennadiy (2003). Демографічні наслідки голодомору 1933 р. в Україні. Всесоюзний перепис 1937 р. в Україні: документи та матеріали [Demographic consequences of the 1933 Holodomor in Ukraine. The all-Union census of 1937 in Ukraine: Documents and Materials]. Kiev: Institute of History. ISBN 978-966-02-3014-9. Mart Laar (2010). The Power of Freedom – Central and Eastern Europe after 1945. Unitas Foundation. ISBN 978-9949-21-479-2. Retrieved 2 November 2015. Liber, George. Total wars and the making of modern Ukraine, 1914-1954 ( U of Toronto Press, 2016). Mace, James E. (2004). "Soviet Man-Made Famine in Ukraine". In Totten, Samuel; Parsons, William S.; Charny, Israel W. Century of Genocide: Critical Essays and Eyewitness Accounts. London: Routledge. ISBN 978-0-415-94430-4. Mace, James E. (2008). Ваші мертві вибрали мене ... [Your dead chose me ...]. Kiev: Vyd-vo ZAT "Ukraïns'ka pres-hrupa". ISBN 978-966-8152-13-9. (A collection of Mace's articles and columns published in Den from 1993 to 2004). Marples, David R. (2007). Heroes and Villains: Creating National History in Contemporary Ukraine. Budapest: Central European University Press. ISBN 978-963-7326-98-1. Meslé, France; Pison, Gilles; Vallin, Jacques (2005). "France-Ukraine: Demographic Twins Separated by History" (PDF). Population and Societies (413): 1–4. Archived from the original (PDF) on 19 May 2011. Mordini, Emilio; Green, Manfred (2009). Identity, Security and Democracy: The Wider Social and Ethical Implications of Automated Systems for Human Identification (PDF). Amsterdam, Netherlands: IOS Press. ISBN 978-1-58603-940-0. Naimark, Norman M. (2010). Stalin's Genocides. Princeton, NJ: Princeton University Press. ISBN 978-0-691-14784-0. Pipes, Richard (1995). Russia Under the Bolshevik Regime. New York, NY: Vintage Books. ISBN 978-0-679-76184-6. Potocki, Robert (2003). Polityka państwa polskiego wobec zagadnienia ukraińskiego w latach 1930–1939 (in Polish and English). Lublin: Instytut Europy Środkowo-Wschodniej. ISBN 978-83-917615-4-0. Pourchot, Georgeta (2008). Eurasia Rising: Democracy and Independence in the Post-Soviet Space. Santa Barbara, CA: ABC-CLIO. ISBN 978-0-275-99916-2. Radzinsky, Edvard (1996). Stalin: The First In-depth Biography Based on Explosive New Documents from Russia's Secret Archives. London: Hodder & Stoughton. ISBN 978-0-340-60619-3. Rosefielde, Steven (1983). "Excess Mortality in the Soviet Union: A Reconsideration of the Demographic Consequences of Forced Industrialization, 1929–1949". Soviet Studies. 35 (3): 385–409. doi:10.1080/09668138308411488. JSTOR 151363. Rosefielde, Steven (2009). Red Holocaust. Milton Park: Routledge. ISBN 978-0-415-77756-8. Sternberg, Robert J.; Sternberg, Karin (2008). The Nature of Hate. New York, NY: Cambridge University Press. ISBN 978-0-521-72179-0. Subtelny, Orest (2009) . Ukraine: A History (4th revised ed.). Toronto: University of Toronto Press. ISBN 978-1-4426-0991-4. Tauger, Mark B. (1991). "The 1932 Harvest and the Famine of 1933" (PDF). Slavic Review. 50 (1): 70–89. doi:10.2307/2500600. JSTOR 2500600. Archived from the original (PDF) on 14 January 2016. Tauger, Mark B. (2001). "Natural Disasters and Human Actions in the Soviet Famine of 1931–1933". The Carl Beck Papers in Russian & East European Studies (1506). Tottle, Douglas (1987). Fraud, Famine, and Fascism: the Ukrainian Genocide Myth from Hitler to Harvard. Toronto: Progress Books. ISBN 978-0-919396-51-7. Vallin, Jacques; Meslé, France; Adamets, Serguei; Pyrozhkov, Serhii (2002). "A New Estimate of Ukrainian Population Losses during the Crises of the 1930s and 1940s" (PDF). Population Studies. 56 (3): 249–264. doi:10.1080/00324720215934. PMID 12553326. Várdy, Steven Béla; Várdy, Agnes Huszár (2007). "Cannibalism in Stalin's Russia and Mao's China" (PDF). East European Quarterly. 41 (2): 223–238. Weiss-Wendt, Anton (2005). "Hostage of Politics: Raphael Lemkin on 'Soviet Genocide'" (PDF). Journal of Genocide Research. 7 (4): 551–559. doi:10.1080/14623520500350017. Archived from the original (PDF) on 10 June 2007. Werth, Nicolas (2010). "Mass deportations, Ethnic Cleansing, and Genocidal Politics in the Latter Russian Empire and the USSR". In Donald Bloxham; A. Dirk Moses. The Oxford Handbook of Genocide Studies. Oxford: Oxford University Press. ISBN 978-0-19-923211-6. Wheatcroft, Stephen G. (2000). A Note on Demographic Data as an Indicator of the Tragedy of the Soviet Village, 1931–33 (draft) (PDF). Retrieved 31 July 2012. Wheatcroft, Stephen G. (2001a). "Current knowledge of the level and nature of mortality in the Ukrainian famine of 1931–3" (PDF). In V. Vasil'ev; Y. Shapovala. Komandiri velikogo golodu: Poizdki V.Molotova I L.Kaganovicha v Ukrainu ta na Pivnichnii Kavkaz, 1932–1933 rr. Kiev: Geneza. Уиткрофт, С. [Wheatcroft, S.] (2001b). "О демографических свидетельствах трагедии советской деревни в 1931–1933 гг." [On demographic evidence of the tragedy of the Soviet village in 1931–1933]. In V.P. Danilov; et al. Трагедия советской деревни: Коллективизация и раскулачивание 1927–1939 гг. : Документы и материалы [The Tragedy of the Soviet Village: Collectivization and Dekulakization 1927–39: Documents and Materials] (in Russian). 3. Moscow: ROSSPEN. ISBN 978-5-8243-0225-7. Archived from the original on 20 March 2008. Wheatcroft, Stephen G. (2004). "Towards Explaining the Soviet Famine of 1931–1933: Political and Natural Factors in Perspective". Food and Foodways. 12 (2–3): 107–136. doi:10.1080/07409710490491447. Wilson, Andrew (2002). The Ukrainians: Unexpected Nation (2nd ed.). New Haven, CT: Yale University Press. ISBN 978-0-300-09309-4. Ammende, Ewald, Human life in Russia, (Cleveland: J.T. Zubal, 1984), Reprint, Originally published: London, England: Allen & Unwin, 1936. The Black Deeds of the Kremlin: a white book, S.O. Pidhainy, Editor-In-Chief, (Toronto: Ukrainian Association of Victims of Russian-Communist Terror, 1953), (Vol. 1 Book of testimonies. Vol. 2. The Great Famine in Ukraine in 1932–1933). Davies, R.W., The Socialist offensive: the collectivization of Soviet agriculture, 1929–1930, (London: Macmillan, 1980). Der ukrainische Hunger-Holocaust: Stalins verschwiegener Völkermord 1932/33 an 7 Millionen ukrainischen Bauern im Spiegel geheimgehaltener Akten des deutschen Auswärtigen Amtes, (Sonnebühl: H. Wild, 1988), By Dmytro Zlepko. [eine Dokumentation, herausgegeben und eingeleitet von Dmytro Zlepko]. Dolot, Miron, Who killed them and why? : in remembrance of those killed in the Famine of 1932–1933 in Ukraine, (Cambridge, Massachusetts: Harvard University, Ukrainian Studies Fund, 1984);"Execution By Hunger, The Hidden Holocaust" (W.W. Norton & Company,1985). Dushnyk, Walter, 50 years ago: the famine holocaust in Ukraine, (New York: Toronto: World Congress of Free Ukrainians, 1983). Famine in the Soviet Ukraine 1932–1933: a memorial exhibition, Widener Library, Harvard University, prepared by Oksana Procyk, Leonid Heretz, James E. Mace (Cambridge, Massachusetts: Harvard College Library, distributed by Harvard University Press, 1986). Famine in Ukraine 1932–33, edited by Roman Serbyn and Bohdan Krawchenko (Edmonton: Canadian Institute of Ukrainian Studies, 1986). (Selected papers from a conference held at the Universite du Quebec a Montreal in 1983). Gregorovich, Andrew, "Black Famine in Ukraine 1932–33: A Struggle for Existence", Forum: A Ukrainian Review, No. 24, (Scranton: Ukrainian Workingmen's Association, 1974). Halii, Mykola, Organized famine in Ukraine, 1932–1933, (Chicago: Ukrainian Research and Information Institute, 1963). Hlushanytsia, Pavlo, "Tretia svitova viina Pavla Hlushanytsi == The third world war of Pavlo Hlushanytsia", translated by Vera Moroz, (Toronto: Anabasis Magazine, 1986). [Bilingual edition in Ukrainian and English]. Holod na Ukraini, 1932–1933: vybrani statti, uporiadkuvala Nadiia Karatnyts'ka, (New York: Suchasnist', 1985). Holod 1932–33 rokiv na Ukraini: ochyma istorykiv, movoij dokumentiv, (Kiev: Vydavnytstvo politychnoyi literatury Ukrainy, 1990). Hryshko, Vasyl, The Ukrainian Holocaust of 1933, Edited and translated by Marco Carynnyk, (Toronto: Bahrianyi Foundation, SUZHERO, DOBRUS, 1983). "The Institute of National Remembrance | Holodomor. The Great Famine in Ukraine 1932–1933". Ipn.gov.pl. 2009. Archived from the original on 18 May 2015. Retrieved 6 July 2015.
International Commission of Inquiry into the 1932–33 Famine in Ukraine, Proceedings [transcript], 23–27 May 1988, Brussels, Belgium, Jakob W.F. Sundberg, President; Legal Counsel, World Congress of Free Ukrainians: John Sopinka, Alexandra Chyczij; Legal Council for the Commission, Ian A. Hunter, 1988.
International Commission of Inquiry into the 1932–33 Famine in Ukraine. Proceedings [transcript], 21 October – 5 November 1988, New York City, [Jakob W.F. Sundberg, President; Counsel for the Petitioner, William Liber; General Counsel, Ian A. Hunter], 1988.
International Commission of Inquiry into the 1932–1933 Famine in Ukraine. Final report, [Jacob W.F. Sundberg, President], 1990. [Proceedings of the International Commission of Inquiry and its Final report are in typescript, contained in 6 vols. Copies available from the World Congress of Free Ukrainians, Toronto]. Kalynyk, Oleksa, Communism, the enemy of mankind: documents about the methods and practise of Russian Bolshevik occupation in Ukraine, (London, England: The Ukrainian Youth Association in Great Britain, 1955). Klady, Leonard, "Famine Film Harvest of Despair", Forum: A Ukrainian Review, No. 61, Spring 1985, (Scranton: Ukrainian Fraternal Association, 1985). Kolektyvizatsia і Holod na Ukraini 1929–1933: Zbirnyk documentiv і materialiv, Z.M. Mychailycenko, E.P. Shatalina, S.V. Kulcycky, eds., (Kiev: Naukova Dumka, 1992). Kostiuk, Hryhory, Stalinist rule in Ukraine: a study of the decade of mass terror, 1929–1939, (Munich: Institut zur Erforschung der UdSSSR, 1960). Kovalenko, L.B. & Maniak, B.A., eds., Holod 33: Narodna knyha-memorial, (Kiev: Radians'kyj pys'mennyk, 1991). Krawchenko, Bohdan, Social change and national consciousness in twentieth-century Ukraine, (Basingstoke: Macmillan in association with St. Anthony's College, Oxford, 1985). Lettere da Kharkov: la carestia in Ucraina e nel Caucaso del Nord nei rapporti dei diplomatici italiani, 1932–33, a cura di Andrea Graziosi, (Torino: Einaudi, 1991). Mace, James E., Communism and the dilemma of national liberation: national communism in Soviet Ukraine, 1918–1933, (Cambridge, Massachusetts: Distributed by Harvard University Press for the Ukrainian Research Institute and the Ukrainian Academy of Arts and Sciences in the U.S., 1983). Makohon, P., Svidok: Spohady pro 33-ho, (Toronto: Anabasis Magazine, 1983). Martchenko, Borys, La famine-genocide en Ukraine: 1932–1933, (Paris: Publications de l'Est europeen, 1983). Marunchak, Mykhailo H., Natsiia v borot'bi za svoie isnuvannia: 1932 і 1933 v Ukraini і diiaspori, (Winnipeg: Nakl. Ukrains'koi vil'noi akademii nauk v Kanadi, 1985). Memorial, compiled by Lubomyr Y. Luciuk and Alexandra Chyczij; translated into English by Marco Carynnyk, (Toronto: Published by Kashtan Press for Canadian Friends of "Memorial", 1989). [Bilingual edition in Ukrainian and English. this is a selection of resolutions, aims and objectives, and other documents, pertaining to the activities of the Memorial Society in Ukraine]. Mishchenko, Oleksandr, Bezkrovna viina: knyha svidchen', (Kiev: Molod', 1991). Oleksiw, Stephen, The agony of a nation: the great man-made famine in Ukraine, 1932–1933, (London: The National Committee to Commemorate the 50th Anniversary of the Artificial Famine in Ukraine, 1932–1933, 1983). Pavel P. Postyshev, envoy of Moscow in Ukraine 1933–1934, [selected newspaper articles, documents, and sections in books], (Toronto: World Congress of Free Ukrainians, Secretariat, , The 1932–33 Famine in Ukraine research documentation). Pidnayny, Alexandra, A bibliography of the great famine in Ukraine, 1932–1933, (Toronto: New Review Books, 1975). Pravoberezhnyi, Fedir, 8,000,000: 1933-i rik na Ukraini, (Winnipeg: Kultura і osvita, 1951). Senyshyn, Halyna, Bibliohrafia holody v Ukraini 1932–1933, (Ottawa: Montreal: UMMAN, 1983). Solovei, Dmytro, The Golgotha of Ukraine: eye-witness accounts of the famine in Ukraine, compiled by Dmytro Soloviy, (New York: Ukrainian Congress Committee of America, 1953). Stradnyk, Petro, Pravda pro soviets'ku vladu v Ukraini, (New York: N. Chyhyryns'kyi, 1972). Taylor, S.J., Stalin's apologist: Walter Duranty, the New York Times' man in Moscow, (New York: Oxford University Press, 1990). The Foreign Office and the famine: British documents on Ukraine and the great famine of 1932–1933, edited by Marco Carynnyk, Lubomyr Y. Luciuk and Bohdan Kor. The man-made famine in Ukraine (Washington D.C.: American Enterprise Institute for Public Policy Research, 1984). [Seminar. Participants: Robert Conquest, Dana Dalrymple, James Mace, Michael Nowak]. United States, Commission on the Ukraine Famine. Investigation of the Ukrainian Famine, 1932–1933: report to Congress / Commission on the Ukraine Famine, [Daniel E. Mica, Chairman; James E. Mace, Staff Director]. (Washington D.C.: U.S. G.P.O. : For sale by the Supt. of Docs, U.S. G.P.O., 1988), (Dhipping list: 88-521-P). United States, Commission on the Ukrainian Famine. Oral history project of the Commission on the Ukraine Famine, James E. Mace and Leonid Heretz, eds. (Washington, D.C.: Supt. of Docs, U.S. G.P.O., 1990). Velykyi holod v Ukraini, 1932–33: zbirnyk svidchen', spohadiv, dopovidiv ta stattiv, vyholoshenykh ta drukovanykh v 1983 rotsi na vidznachennia 50-littia holodu v Ukraini – The Great Famine in Ukraine 1932–1933: a collection of memoirs, speeches and essays prepared in 1983 in commemoration of the 50th anniversary of the Famine in Ukraine during 1932–33, [Publication Committee members: V. Rudenko, T. Khokhitva, P. Makohon, F. Podopryhora], (Toronto: Ukrains'ke Pravoslavne Bratstvo Sv. Volodymyra, 1988), [Bilingual edition in Ukrainian and English]. Verbyts'kyi, M., Naibil'shyi zlochyn Kremlia: zaplianovanyi shtuchnyi holod v Ukraini 1932–1933 rokiv, (London, England: DOBRUS, 1952). Voropai, Oleksa, V deviatim kruzi, (London, England: Sum, 1953). Wheatcroft, S. G. (2000). "The Scale and Nature of Stalinist Repression and its Demographic Significance: On Comments by Keep and Conquest" (PDF). Europe-Asia Studies. 52 (6): 1143–1159. doi:10.1080/09668130050143860. ISSN 0966-8136. PMID 19326595. Voropai, Oleksa, The Ninth Circle: In Commemoration of the Victims of the Famine of 1933, Olexa Woropay; edited with an introduction by James E. Mace, (Cambridge, Massachusetts: Harvard University, Ukrainian Studies Fund, 1983). Rajca, Czesław (2005). Głód na Ukrainie. Lublin/Toronto: Werset. ISBN 978-83-60133-04-0. Bruski, Jan Jacek (2008). Hołodomor 1932–1933. Wielki Głód na Ukrainie w dokumentach polskiej dyplomacji i wywiadu (in Polish). Warszawa: Polski Instytut Spraw Międzynarodowych. ISBN 978-83-89607-56-0. Wikimedia Commons has media related to Holodomor. "Holodomor survivors share their stories". Retrieved 5 November 2013. "Harvard Ukrainian Research Institute's MAPA Digital Atlas of Ukraine focus on the history of the Holodomor". Retrieved 5 November 2013. "Gareth Jones' international exposure of the Holodomor, plus many related background articles". Retrieved 5 July 2006. Stanislav Kulchytsky, Italian Research on the Holodomor, October 2005. (in Russian)/(in Ukrainian) Valeriy Soldatenko, "A starved 1933: subjective thoughts on objective processes", Zerkalo Nedeli, 28 June – 4 July 2003. Available online in Russian and in Ukrainian. "How many of us perish in Holodomor on 1933", 23 November 2002 – 29 November 2002. Available online in Russian and in Ukrainian. "Reasons of the 1933 famine in Ukraine. Through the pages of one almost forgotten book" 16–22 August 2003. Available online in Russian and in Ukrainian. "Reasons of the 1933 famine in Ukraine-2", 4 October 2003 – 10 October 2003. Available online in Russian and in Ukrainian. "Demographic losses in Ukraine in the twentieth century", 2 October 2004 – 8 October 2004. Available online in Russian and in Ukrainian. The General Committee decided this afternoon not to recommend the inclusion of an item on the seventy-fifth anniversary of the Great Famine (Holodomor) of 1932–1933 in Ukraine. Caryle Murphy (1 October 1983). "Ukrainian Americans Commemorate Famine in Homeland 50 Years Ago". The Washington Post. Archived from the original on 15 March 2012. People's war 1917–1932 by Kiev city organization "Memorial"
Lazar Moiseyevich Kaganovich was a Soviet politician and administrator and one of the main associates of Joseph Stalin. He is known for helping Stalin seize power, for his role in the Soviet famine of 1932–33 in Ukraine, and for his harsh treatment and execution of those deemed threats to Stalin's regime. Throughout Russian history famines and droughts have been a common feature, often resulting in humanitarian crises traceable to political or economic instability, poor policy, environmental issues and war. Droughts and famines in Russia and the Soviet Union tended to occur fairly regularly, with famine occurring every 10–13 years and droughts every five to seven years. Golubev and Dronin distinguish three types of drought according to productive areas vulnerable to droughts: Central, Southern, and Eastern. Throughout the history of the Soviet Union, tens of millions of people suffered political repression, which was an instrument of the state since the October Revolution. It culminated during the Stalin era, then declined, but continued to exist during the "Khrushchev Thaw", followed by increased persecution of Soviet dissidents during the Brezhnev stagnation, and did not cease to exist until late in Mikhail Gorbachev's glasnost and perestroika. Pavel Petrovich Postyshev was a Soviet politician. He is considered to be one of the principal architects of the famine of 1932–1933, known in Ukraine as Holodomor. The Soviet famine of 1932–33 was a major famine that killed millions of people in the major grain-producing areas of the Soviet Union, including Ukraine, Northern Caucasus, Volga Region and Kazakhstan, the South Urals, and West Siberia. The Holodomor in Ukraine and Kazakh famine of 1932–33 have been seen as genocide committed by Joseph Stalin's government; it is estimated between 3.3 and 7.5 million died in Ukraine and ~2,000,000 died in Kazakhstan. Grigory Ivanovich Petrovsky was a Ukrainian Soviet politician. He participated in signing the Treaty on the Creation of the USSR and the Treaty of Brest-Litovsk. Petrovsky was one of the officials responsible for implementing Stalin's policies such as collectivization and for Holodomor, the subsequent man-made famine that took place in Soviet Ukraine in 1932 and 1933 and killed millions of Ukrainians. The Soviet Census held on January 6, 1937 was the most controversial of the censuses taken within the Union of Soviet Socialist Republics. The census results were not published because the census showed much lower population figures than anticipated, although it still showed a population growth from the last census in 1926, from 147 million to 162 million people in 1937. Denial of the Holodomor is the false assertion that the 1932–1933 Holodomor, a man-made famine in Soviet Ukraine, did not occur or diminishing the scale and significance of the famine. This denial and suppression of information about the famine was made in official Soviet propaganda from the very beginning until the 1980s. It was supported by some Western journalists and intellectuals. It was echoed at the time of the famine by some prominent Western journalists, including Walter Duranty and Louis Fischer. The denial of the man-made famine was a highly successful and well orchestrated disinformation campaign by the Soviet government. According to Robert Conquest, it was the first major instance of Soviet authorities adopting the Big Lie propaganda technique to sway world opinion, to be followed by similar campaigns over the Moscow Trials and denial of the Gulag labor camp system. The International Commission of Inquiry Into the 1932–1933 Famine in Ukraine was set up in 1984 and was initiated by the World Congress of Free Ukrainians to study and investigate the 1932-1933 Famine in Ukraine. Members of Commission selected and invited by World Congress of Free Ukrainians. None of them represent own country or country authority/institution and act as individual. Most of them are retired jurists, one of them died before Commission finish their investigations. The Commission was funded by donations from the worldwide Ukrainian diaspora. 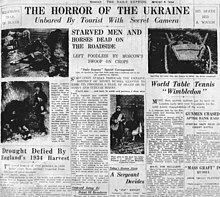 The Holodomor genocide question consists of the attempts to determine whether the Holodomor, a 1933 man-made famine that killed about 4 million people in Ukraine, was an ethnic genocide or an unintended result of the "Soviet regime's re-direction of already drought-reduced grain supplies to attain economic and political goals." The event is recognized as a genocide in Ukraine while the Russian Federation considers it part of the wider Soviet famine of 1932–33 and corresponding famine relief effort. The debate among historians is ongoing and there is no international consensus among scholars or governments on whether the Soviet policies that caused the famine fall under the definition of genocide. Collectivization in Ukraine, officially the Ukrainian Soviet Socialist Republic, was part of the policy of Collectivization in the USSR and dekulakization that was pursued between 1928 and 1933 with the purpose to consolidate individual land and labour into collective farms called kolkhoz and to eliminate enemies of the working class. The idea of collective farms was seen by peasants as a revival of serfdom. The causes of the Holodomor, the name of the famine that ravaged Soviet Ukraine in 1932–1933 whose estimates for the total number of casualties within Soviet Ukraine range between 2.2 million and 10 million, are a subject of scholarly and political debate. 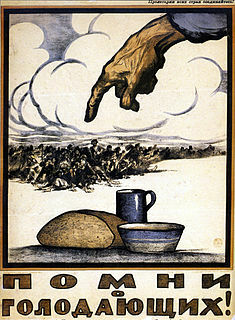 Some historians theorize that the famine was an unintended consequence of the economic problems associated with radical economic changes implemented during the period of Soviet industrialization. Others claim that the Soviet policies that caused the famine were an engineered attack on Ukrainian nationalism, or more broadly, on all peasants, in order to prevent uprisings. Some suggest that the famine may fall under the legal definition of genocide. The Holodomor was a man-made famine in the Ukrainian SSR and adjacent Cossack territories between 1932 and 1933 that caused the deaths of millions of Ukrainians due to starvation. The famine is formally considered by the modern Ukrainian government to be an act of genocide on the part of the Soviet government; others in the international community, as well as the United Nations, also recognize it as such. Some countries recognize the Holodomor famine as an attack on the Ukrainian people, but do not recognize it as a genocide. The Russian Federation denies officially that it was an act of genocide, but rather states that the famine caused suffering among many in the Soviet Union, regardless of nationality. Mendel Khatayevich was a Soviet politician. The National Museum "Holodomor victims Memorial", formerly known as the Memorial in Commemoration of Famines' Victims in Ukraine, is Ukraine's national museum and a world-class centre devoted to the victims of the Holodomor of 1932-1933. The museum was opened on the day of the 75th anniversary of the Holodomor in 2008 and gained the status of a national museum in 2010. The museum is located on the Pechersk Hills on the right bank of the Dnieper river in Kiev, adjacent to the Kiev Pechersk Lavra. Bitter Harvest is a 2017 period romantic-drama film set in Soviet Ukraine in the early 1930s showing the Ukrainian The film stars Max Irons, Samantha Barks, Barry Pepper, Tamer Hassan and Terence Stamp. The Holodomor Memorial to Victims of the Ukrainian Famine-Genocide of 1932–1933 was opened in Washington, D.C., United States on November 7, 2015. Located at the intersection of North Capitol Street, Massachusetts Avenue, and F Streets N.W., the memorial was built by the National Park Service and the Ukrainian government to honor the victims of the Ukrainian Famine-Genocide of 1932–33 and educate the American public. The memorial is one of three monuments in Washington, D.C. designed or co-designed by women Congress approved creation of the Holodomor Memorial in 2006. Estimates of the number of deaths attributable to Joseph Stalin vary widely. Some scholars assert that record-keeping of the executions of political prisoners and ethnic minorities are neither reliable nor complete, others contend archival materials contain irrefutable data far superior to sources utilized prior to 1991, such as statements from emigres and other informants. Those historians working after the Soviet Union's dissolution have estimated victim totals ranging from approximately 3 million to nearly 9 million. Some scholars still assert that the death toll could be in the tens of millions.